NuMedii has been pioneering the use of Big Data, Artificial Intelligence (AI) and systems biology since 2010 to accelerate the discovery of precision therapies to address high unmet medical needs. Enormous amounts of genomic, molecular and other biomedical data and knowledge pertaining to diseases and the behavior of drugs in various model systems are being generated and continue to expand exponentially. The key challenge is efficiently extracting meaning from these vast knowledge and data stores in a way that uncovers new therapeutic options for patients, particularly those who are diagnosed with cancer or rare diseases. 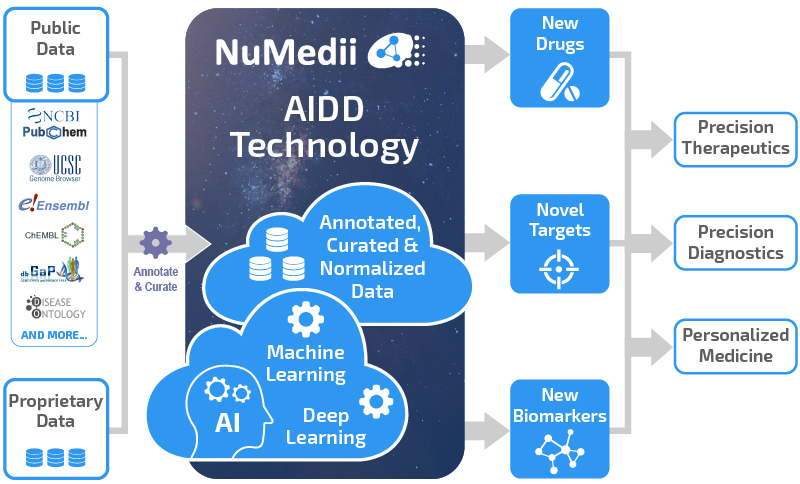 As a next generation biopharma company, NuMedii has built a powerful technology, AIDD (Artificial Intelligence for Drug Discovery) that harnesses Big Data and AI to rapidly discover connections between drugs and diseases at a systems level. We have efficiently extracted information from a vast array of disparate data stores to create a structured, proprietary data resource spanning hundreds of diseases and thousands of compounds. Our proprietary AI and machine learning algorithms enable us to extend well beyond conventional ‘target-centric’ drug discovery approaches by facilitating the exploration of favorable ‘poly-pharmacology’ profiles that can potentially improve therapeutic efficacy by modulating effects on multiple disease pathways. The patterns and correlations connecting biomedical concepts have become increasingly complex. The computing power required to quickly process huge volumes and varieties of data simply cannot be achieved via traditional data and software architectures. Artificial Intelligence approaches are a natural fit to harness Big Data. They provide a framework to ‘train’ computers to recognize patterns and sift through vast amounts of new and existing genomic and other biomedicial data to unravel diverse complex biological networks involved in disease processes. These AI approaches can also identify subsets of patients and therapies that are likely to modulate these complex networks for each patient subgroup. Our proprietary AIDD technology utilizes multiple AI methods, ranging from classical machine learning techniques to newer deep learning systems. Our AIDD technology helps speed up drug discovery, cut R&D costs and decrease failure rates in clinical trials, all of which can eventually lead to better, more precise medicines. Rapid advances in technology have driven down the cost of generating biological data. This has led to an exponential growth in the availability of these data, and overwhelmed existing analyses and process practices – creating a “Big Data Age of Biology.” Like Big Data challenges in other domains, Big Data in biology also brings its own set of challenges due to the number of data types and the complex relationships that accompany them. At NuMedii, we have integrated information from enormous, disparate data sets all in different formats and from various sources to create a comprehensive repository of available data and knowledge that enables us to traverse relevant information very rapidly. Our data models span five billion facts and trillions of data points to help reveal relationships between drugs and the diseases they treat. An estimated 90 percent of conventional and blockbuster medicines only work for 30-50 percent of patients and account for 30 percent of acute hospital admissions caused by side effects and adverse events. This lack of efficacy could be attributed to differences in individual patients and their response to therapies. A deeper understanding of the complexity of disease manifestation at the molecular and clinical levels will enable us to better understand the networks involved in these diseases and identify subsets of patients in whom specific treatments may be more effective. We’re using Big Data and AI to enable the discovery of precision therapies that will modulate diverse networks involved in diseases. Our AIDD technology can help with myriad aspects of drug discovery including identifying patient subgroups, new therapeutic options (including combinations) and biomarkers. We aim to improve patient outcomes, quickly eliminate unlikely development paths, and increase the product pipeline and speed-to-market for efficacious new therapies for a variety of diseases. Not only do we help partners with their discovery needs, we are also building our own pipeline in rare inflammatory diseases and rare oncology indications.